How would 'IDrive Express' via physical storage shipment help me? I have close to a TB of data. How can I quickly back this up to my cloud account without clogging up my Internet bandwidth? I had placed an order for IDrive Express drive to backup my data. How can I track my shipment? How soon can I expect to see my data online once I ship the drive? My computer has crashed. Can I get the data in my account shipped to me? How soon can I expect my data to be shipped back to me? How does IDrive Express secure my data? Is it possible to backup from multiple computers? Can I backup my open files? 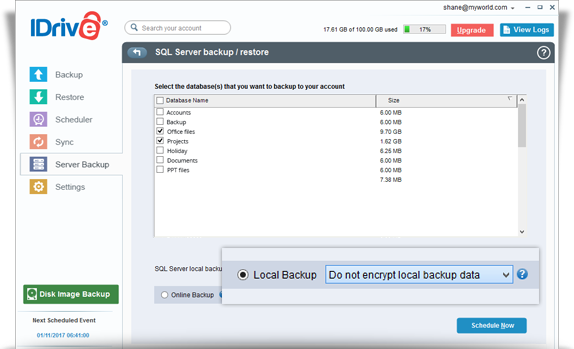 Can I backup or restore my servers and databases using IDrive Express™? I cannot see the files backed up to the Express device, under the Restore tab. What should I do? How do I backup my Time Machine data using IDrive Express™? How does IDrive Express handle symbolic links on my Mac? How do I configure my account with encryption using Command Line Utility? 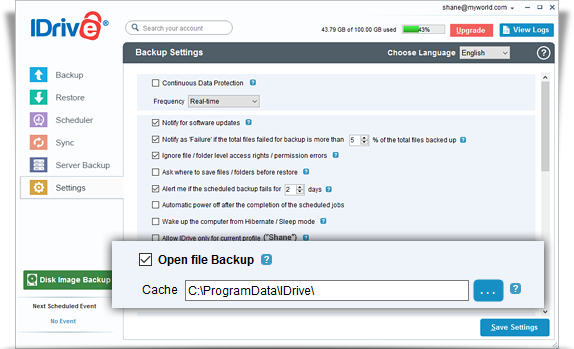 IDrive allows for quick backup and retrieval of your data via a temporary storage device. This service comes FREE for Express Backup, once a year for Personal users and thrice yearly for Business users. Subsequent backup requests will be subject to the $59.95 charge. Express Restores will be charged $99.50 per request. This service includes free return shipping for customers within the USA. Express orders shipped outside the United States may have additional shipping costs. Upon placing the order, our team will provide a shipping quote that will be charged separately. The temporary storage device is shipped to your location, thus the load on bandwidth at your end is greatly alleviated. This service enables you to quickly transfer data, often in just a week or under. Your data will be stored encrypted with an optional private key throughout the process. Backing up data of a TB can be done online, but may take several days, often weeks. Use IDrive Express service to physically transfer large amounts of data. Fill in the hard drive shipment form available at https://www.idrive.com/idrive/home/hardDrive. Once, you receive the temporary storage device, connect it to your computer and launch the IDrive application. From the ‘Backup’ tab, select the ‘Backup files to my local / Wi-Fi device’ radio button. Select the temporary storage device as the ‘Backup location on your local drive’ and perform local backup for the data to be transferred. Note: If files are already present in your online backup account and those same files are also sent via IDrive Express, the backup files in your account will be maintained to avoid any conflicts. We recommend you to delete or purge existing data from your online backup account to upload duplicate files from Express device. Ship the storage device back to IDrive. We will upload the data to your IDrive account. Once the data is transferred from the device to your IDrive online account, you can continue incremental backups through the conventional online backup process. Note: You will be responsible for arranging shipping, handling, tracking and insuring the storage device back to IDrive. IDrive assumes no liability for a lost or damaged drive or for loss or breach of data during the return shipment process. You acknowledge that if you don't use the current version of the IDrive application to locally backup your data to the drive, it is possible that the data is possibly stored unencrypted on the storage device and that no sensitive data is included. I had placed an order for IDrive Express drive. How do I know the status of my order? Log in to your IDrive account. From the 'IDrive Express' tab, you can get your order details under the 'Watch your order' section. Once, we receive the storage device with your data, it typically takes 2 to 5 business days to transfer the data to your online account. Occasionally, it may take longer than 10 days due to high volume. 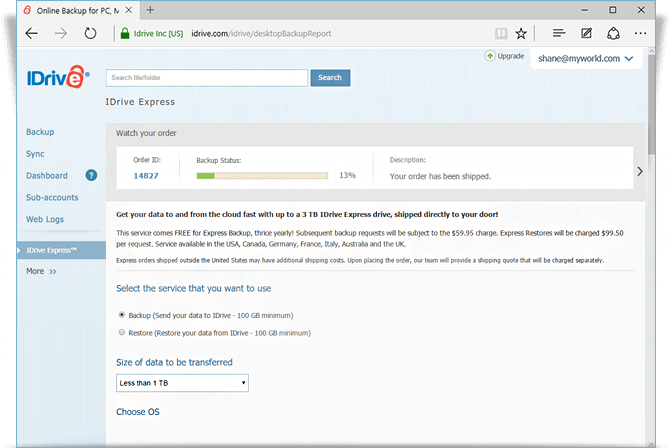 Yes, using IDrive Express service, you can get your backed up data shipped to you. Email us at support@idrive.com with the subject line clearly indicating your IDrive Username. The body of the email must contain details of your request particulars to enable IDrive to assist you. You will receive a confirmation from us stating that IDrive has received your request. Most recent version of your data will be retrieved from our servers onto a temporary storage device, and shipped to you. We will keep you updated on the progress of the query and its status. After you receive the device, plug it into your computer via the USB cable and launch the IDrive application. Go to the ‘Restore’ tab, from the ‘Select files / folders for restore’ drop-down menu, choose the Express device. Select the files and folders to restore to your system and click Restore Now. Once your request has been received, it will take around 2 to 5 business days for data to be transferred to a temporary storage device and shipped to you. Delays may arise due to unforeseen issues with courier/shipping etc. IDrive takes no responsibility for such delays. 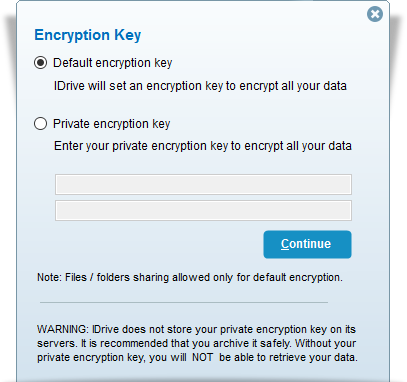 The local backup in IDrive uses industry standard 256-bit AES encryption with an optional private key. Your data is safe throughout the process as it is stored encrypted in the temporary storage device during transit. WARNING: It is recommended that you archive your private encryption key safely to backup and restore your data. However, if you opt for the Default encryption key, you need not remember it. 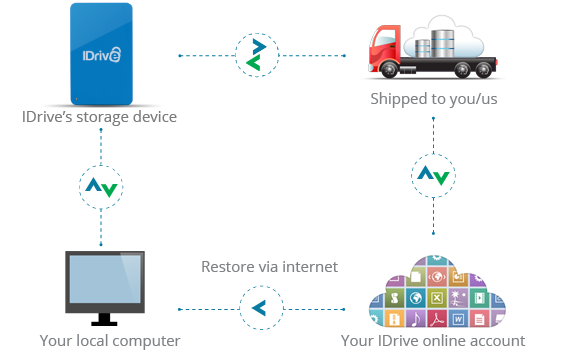 Yes, you can backup data from multiple computers and ship it via IDrive Express™. IDrive creates a unique folder with the name of the computer on the hard drive while locally backing up the data. This prevents data overlap during multiple computers backup. IDrive is capable of backing up open files for supported platforms including Windows Vista, Windows 7, Windows 2008 server and Windows 2003 servers. It is enabled by default. Even if your Microsoft Outlook application is open, the IDrive application does a reliable local backup of associated data. Similarly, your Quickbooks/Quicken and other possible open files are backed up as well. Yes, you can backup or restore MS SQL Server, MS Exchange Server, MS SharePoint Server, Oracle Server, System State data and servers running on Hyper-V and VMware environment, using the IDrive Express service. On request, IDrive sends you a hard drive which you can use to perform Local Backup for your database and server files. Then ship it to your cloud account, or you can directly restore the files sent from your cloud account to your servers and databases. Note: During local backup from servers and databases, you can choose to encrypt or not to encrypt your data. For the files to appear under the 'Restore' tab, ensure that you have chosen the appropriate drive in 'Backup location on your local drive' under the 'Backup' tab. Next ensure that the same drive appears in the 'Select files / folders for restore' field under the 'Restore' tab and click . All the files backed up to your Express device will appear. Time Machine will automatically backup your Mac data including system files, applications, accounts, preferences, email messages, music, photos, movies and documents. By default, the Time Machine data (‘Backups.backupdb’) folder will be excluded from the backup set. As the original files will be already included in your backup set, the same files will not be backed up multiple times, thus saving your account storage space. You should use your personal hard drive, and not IDrive Express hard drive, as the Time Machine backup volume (drive). Plug in the Time Machine backup hard drive and the IDrive Express hard drive. Launch the IDrive application and login to your account. Go to the 'Settings' tab. Under 'Excluded Files / folders from backup' section, select the 'Files/Folders with partial names' option. 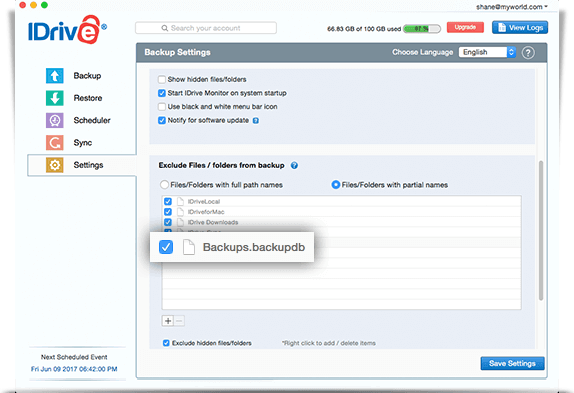 Select the 'Backups.backupdb' folder to include in the backup set. Local backup in IDrive can backup any file or folder, the symbolic links points to. $ idevsutil --config-account --enc-type=PRIVATE --pvt-key=<key file path> --user=<username> --password-file="MyPassword"